The new TX5 electric cab has a range of 640 km (400 miles). LONDON -- London's iconic black cab now has an electric variant that has just begun picking up passengers in the UK capital. Wi-Fi, USB charging and even a sunroof are among the new features of the six-seat, battery-powered taxis that come with a range extender that allows the cab to travel a combined 640 km (400 miles). Fares match those of diesel predecessors, so commuters can travel at no additional cost. 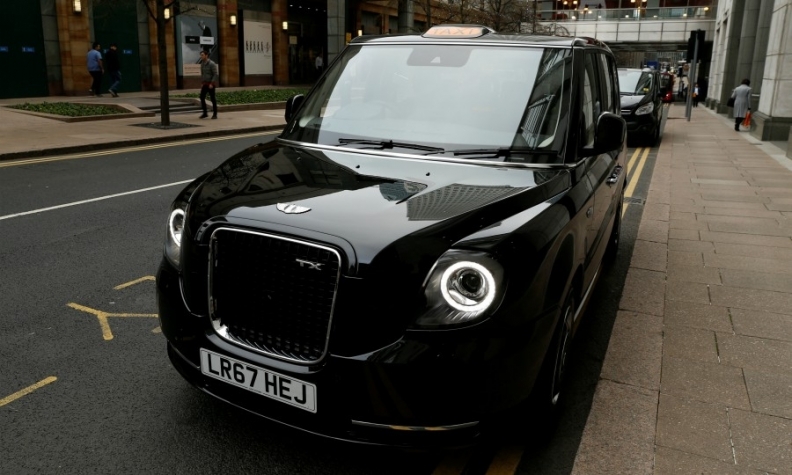 "You can see very clearly this is a London black cab," Chris Gubbey, CEO of the London Electric Vehicle Company, a unit of Chinese-owned Geely, told Reuters. "However, everything is new. It has an all-aluminum body and electric engine with range extender. But most importantly, it's bringing clean air to London," he said. The taxi drives in full-electric mode all the time and uses a 1.5-liter gasoline engine supplied by Volvo that doesn't drive the wheels but charges the battery and extends the range. Volvo is also owned by Geely. Although the upgrade to the new electric model will cost cab drivers about 55,000 pounds ($74,000), Gubbey says it will also save about 100 pounds on average weekly fuel costs. "It's not a step up, it's a thousand steps up, it's a different world," said Pat Follen, who switched to one of the new vehicles after nearly 10 years driving older diesel versions. "All you can hear really is the tires on the tarmac - and the wind." The cabs come just ahead of new rules London is adopting within a few weeks for new taxis to be either plug-in hybrid or completely emissions-free. More than 9,000 electric taxis, or about half the current fleet of black cabs, are expected on the capital's roads by 2021. Gubbey's company hasn't stopped at London. It plans to roll out 225 vehicles in Amsterdam as part of a transport service for the elderly and disabled. A second continental European location is also in the planning, Gubbey added. The company, formerly known as the London Taxi Company, expects to sell 10,000 vehicles a year by the turn of the decade, half of them outside Britain.